five minutes ago I was leaving the hospital with a little newborn bundle and now I'm trying to keep hold of a wiggly little boy who laughs, chews things and watches everything his big brother does in amazement. I always say it but the time really does fly. And here I am again trying to work out whether he is ready for food yet..
Only this time I think I'm the one who isn't ready! but whereas first time round I was eager to see our little guy eating real food I'm much more apprehensive with Little E. I don't want to accept the speed he's growing at, I love the feeling of being completely relied on and being able to give him everything he needs! But my feelings are quickly replaced by wanting to see my two boys eating together and watching him grow as big and strong as his brother. although he isn't sitting independently yet he does hold himself up for a while and has mastered grabbing things and putting them into his own mouth. He also watches with serious fascination when I'm eating! I do actually love the weaning stage really, as there are so many great ideas out there for introducing different foods and I loved coming up with different things for the little guy to try. my plan is to start with baby rice or rusk as an introductory food and then gradually move into different flavours; I would always go down the baby led route though and be guided by the little one as they know when they're ready. 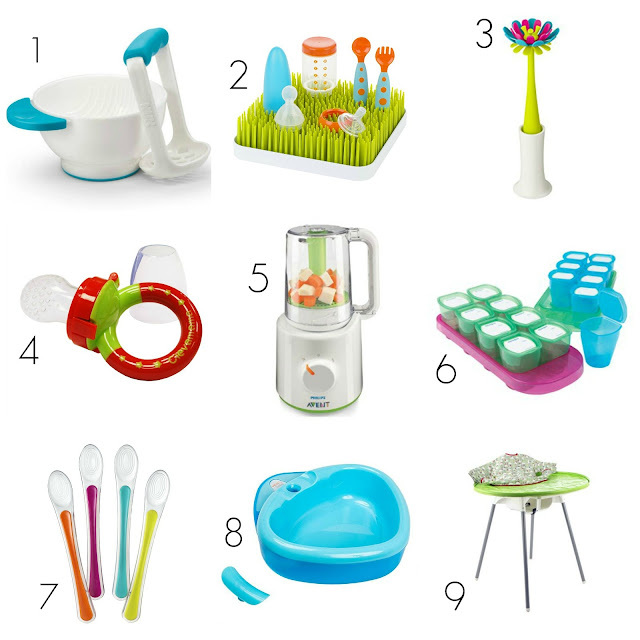 There are some seriously great tools for the weaning stage so I thought I'd share a few of my favourites that I'm thinking will help us along this journey! 2. How awesome are these little grass drying racks by Boon?! Perfect for all those little plastic bits and bobs that always go missing in the washing up bowl. Also I just think it's adorable. 3. Also by Boon, love this silicone flower brush! 4. We had some of these for the little guy but they were a soft mesh rather then silicone which was difficult to clean and he got fed up of it rather quickly, these by Clevamama look great though. I think they'd be great for teething on too. 5. I'm not one for too much gadgetry but this little 2-in-1 blender by Phillips ticks all the boxes for super easy food prep. It steams fruit and veg and then flips over to blend; no pans or bowls required! Definitely tempted to treat myself to this one! 6. There are a lot of freezer pots on the market for storing baby food however from previous experience, the individual pots are best for me as you can just grab them and pop into the changing bag rather than having to put them into another container before you go out. I actually didn't know JoJo Maman Bebe did other baby products, but these look perfect. 8. So these little bowls are quite hard to find in shops but I think they're so handy; the bottom part can be filled with warm water and is sealed to avoid spillage. They're just great for taking the chill off baby food without having to use a pan! brilliant for on-the-go feeding too. This one is by Vital Baby. 9. I saw this yesterday and though it was brilliant for messy meal times! Such great way to get your little one learning to self feed and learning about food! Anything that helps contain the chaos is always very welcome too! This genius invention is by Tidy Tot. Have you got any great products to share that take the stress out of weaning and baby feeding?! ?